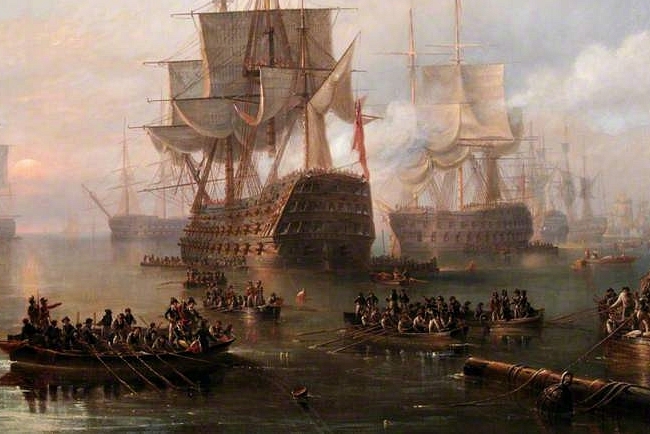 The ship that was to carry Grant, Strange and about a hundred or so other British soldiers from Bordeaux to England was called the Catherine of Winchester. It was a large enough ship, but it was now expected to carry a much greater number of passengers than it was accustomed to. Most of the soldiers were crammed into the overcrowded sleeping quarters of the crew, but several officers had been able to secure cabins. Grant was among them, and he had offered to share his cabin with Strange. Strange, who did not much fancy the idea of spending a week in the dark, cramped hold of the ship, happily accepted his offer. He remarked to Grant as they boarded the ship, that he hoped it would be fast and peaceful voyage, as he longed to return to England as quickly as possible. However fate, it seemed, was determined that Strange was not to get what he wanted. Prompt: On the return journey from the Peninsular to England, a storm hits the ship that Grant and Strange… are travelling in… I’m up for anything from fluff to non-con, in a sea voyage none of them will forget.